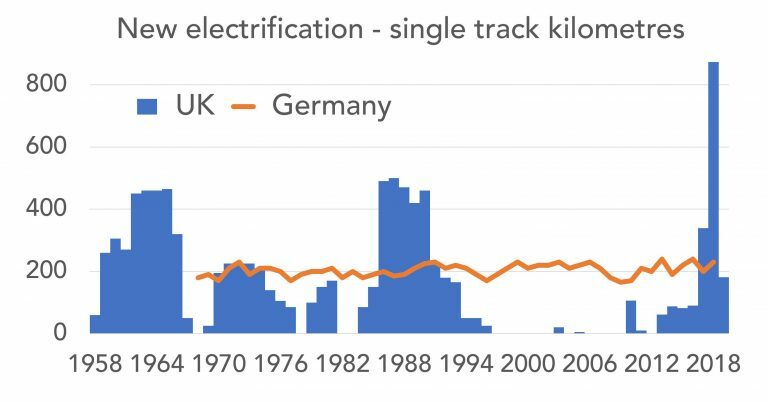 ...benchmarking includes the electrification of 1,362 stk in Denmark over a twelve-year period and in Germany, the 225 stk Ulm to Lindau electrification, both of which are costing circa £1 million/stk. It would seem that these relatively low costs are the result of a steady rolling programme. 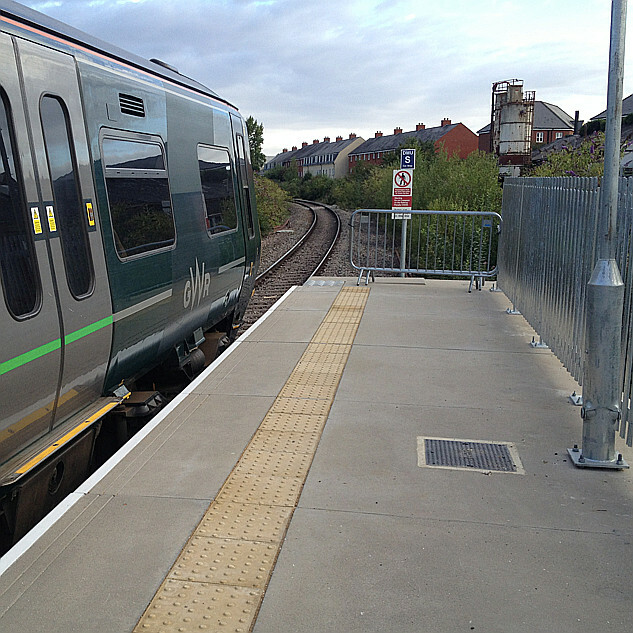 ...There was also a strong view of the value of a rolling electrification programme to retain knowledge and skills. ...The two factors that seem to make a big difference are that Scottish electrification is a relatively small rolling programme and that Transport Scotland is a strong, informed client. But are these £ per stk figures comparable? Continental railways have a very large structure gauge, does this reduce the cost of rebuilding structures for electrification? Not certain that I can agree that the current GWR electrification structures are "over engineered" Having suffered regularly from the failed East coast electrification "no trains in windy weather" I consider that very substantial structures are preferable. In the last few days we have seen a substantial failure of low quality electrification near Paddington, whilst a defective train caused this, the consequences would have been less serious with more substantial construction. Even allowing for the substantial structures, the cost of the GWR electrification still seems very excessive. At first glance, I thought it was a picture of the Dubai skyline. Not necessarily. The fact that the structure gauge is generally bigger, to allow for the bigger rolling stock, doesn’t logically mean the structures originally included additional future electrification clearance. They will still need the extra height. Even when routes in this country have been upgraded from W6 to W12 for high containers it hasn’t automatically provided for wiring as well, because W12 is only very slightly higher than W6 - it’s more about opening out the corners. The trouble here is the stop start nature of the work. We've lost expertise during the non electrification years. Then a whole load of upgrades and repairs are added to the cost - which would have been needed to be done at some point anyway. Then we have to pay out substantial compensation to the many different privatised operators when the track is closed for works, or services are cancelled. Its a mess of a system - which is costly to maintain largely because of the fragmented structure. So it isn't just that our electrification costs a lot - there are other factors that add to the overall costs. 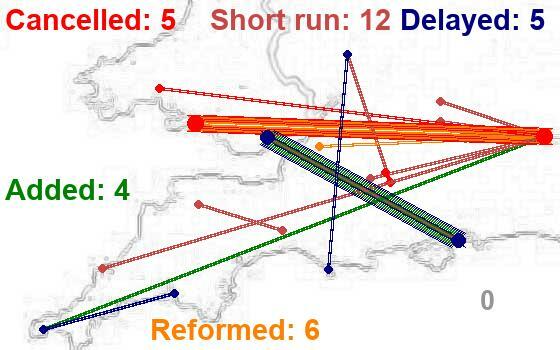 There is nothing new in the concept of progressive electrification; British Railways held this view for 25kV electrification form the mid 1950's which at the time also included the expansion of the third rail system,even the diesel electric locomotives were part of this master plan. The WCML electrification was meant to roll on to the Midland Mainline and East Coast, I saw the BR map produced in the mind 1970's in the Electrification HQ in Marylebone in 1990; it showed the GWML being completed to Bristol, Taunton and Swansea by 2000. The problem is not just "political" - it's more a cultural problem in the decision making levels of our society. After all, there was a sustained period of electrification under Mrs Thatcher, who was always characterised as anti-railway - although it might be because BR divested itself of Sealink, hotels etc it had money to spend. What we need is an overall recognition that steady investment in infrastructure maintenance and improvement is better than feast and famine - and that has to become ingrained at HM Treasury, so that when the latest transient occupant of no 11 Downing Street arrives, he (or she) does not regard it an an optional add on if there's money to spare (or an election to be won), and is not encouraged to do so. Its not just the railways that suffers the feast and famine, Schools, NHS, roads, local authority services, Police ………………………..
You might think there must be a better way to run a country; I couldn't possibly comment. There are actually 3 things that suffer feast and famine and are first to be axed, Maintenance, Training and Research. It doesn't help that they all considered to be revenue costs rather than investments so don't add to the bottom line.